This news item was posted in Analysis category and has 6 Comments so far. During the passage of the most recent stimulus bill there was much debate over if the government spending even has the possibility of being effective. This debate continues today, largely along partisan lines, so I was curious if there is any empirical evidence to support the effectiveness of government stimulus. Clearly there are many factors that affect the economy outside of the scope of the of government spending. One would hope a large enough data set and an effective regression analysis should allow you tease out the impact government spending has even with all other factors considered. While I concede that how the government spent the money might significantly change how it impacts the economy, for this post I am focusing on the aggregate spending of the federal government. This post will analyze the impact spending has on the two broadest measures of economic health: GDP and Unemployment. 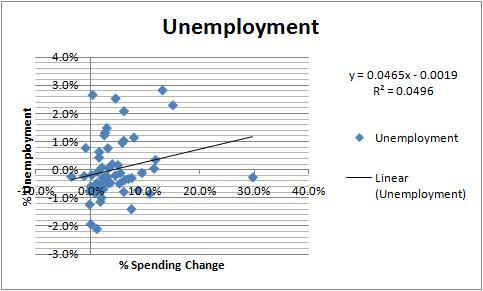 My analysis consisted of plotting the inflation adjusted %change in spending by year against GDP and Unemployment respectively. This makes for nice charts but is not that meaningful from a statistical standpoint. For that I did a linear regression (thank you stats class and Excel 2007) and determined the R-squared value and produced a histogram. Essentially the R-squared value tells you have often you can expect your model to produce an accurate result and the associated “Significance F” tells you how confident you can be in your R-squared value. Historically government spending has almost 0 statistical impact on unemployment and a fairly low predictable impact on GDP. The GDP histogram shows that the line does have a positive slope, meaning that if you increase government spending generally you are going to increase GDP. 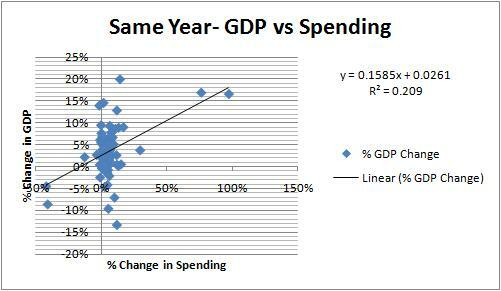 However based on the model above, if you try to predict how changing government spending is going to impact the economy you will only be correct about 1-5 times. Admittedly this is a crude model and I might refine it in the future to determine if how the government spends money has a stronger correlation to the economic performance. However, based on the model above it doesn’t appear that government spending can directly and consistently produce predictable results in the two broadest economic measures we have. 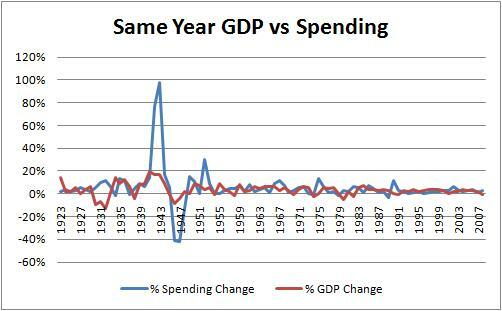 Meaning that government spending most likely won’t do much to stimulate the economy. Thanks and as always comments are welcome, encouraged and appreciated. Good analysis. I’ve always said that the only thing that really stimulates the economy is something new that everyone wants to spend money on to buy or that companies want to spend advertising dollars on. The internet pulled us out of the 80s and war spending pulled us out of the great depression. I thought the IPhone would have done it, but oh well…on to the next great invention! Interesting point from Drew. I’d be interested to see what the biggest “whizbang” gadget or popular money trend was for each of those stimulus years. Pretty hard to quantify, but we DO culturally tend to go through cycles of save then splurge. It’s the equivalent of yo-yo dieting — we can have weeks of chicken salad but eventually, we just HAVE to have the chocolate cake. Two questions… This is just generic gov’t spending that was tracked, right? So the big spending spikes up weren’t specifically for jobs. Spending to bail out airlines, car manufacturers, the steel industry, the textile industry, etc… wouldn’t show an uptick in employment, just a lack of a massive dip. No? On the employment side, do we know if the flat job growth line actually reflects stability? For instance while airlines were folding and letting employees go, were those jobs offset by ones created in the TSA, resulting in a flat employment line? You are correct in that the spending total is an aggregate for the Federal Government. You make a fair point regarding potential spikes in spending serving to prevent large dips. Oh course it is hypothetical since the spending happened to prevent the dip. 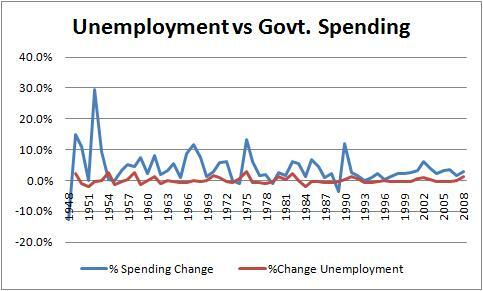 However as the data stands, there is barely any correlations between spending an unemployment. Generally I don’t know if a flat unemployment line is a good or a bad thing. However when you are talking about the millions of jobs across the economy there is always going to be shifting from one industry job type to another so I am not sure if I understand your point. - Are there any controllable factors that due have strong correlation on GDP/Unemployment. I’m a MSc master student doing a dissertation on the effectiveness of fiscal policy in a selected sample of high debt countries and low debt countries. At the current stage, I’m examining the relationship of government spending or taxation on the macroeconomic variables. I have done simple model using excel such 1) relationship between real disposable income and consumer spending which I consider as an effect of taxation, 2) relationship between GDP growth and government spending, 3) relationship between Unemployment and Real government spending. I’m planning on adding another model, that relationship between change in unemployment against the real GDP growth.